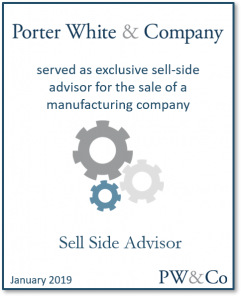 PW&Co Completes Sale of Industrial Manufacturing Company - Porter White Co.
Porter White & Company, a Birmingham-based investment bank, is pleased to announce that it has advised on the sale of an industrial manufacturing company to JBA Capital, LLC. The terms of the asset sale transaction were not disclosed. As the Company’s exclusive investment banker, PW&Co prepared marketing materials, solicited interest from potential acquirers, negotiated a term sheet acceptable to all parties, coordinated due diligence, and oversaw preparation of closing documents and closing. PW&Co’s marketing and sale process allowed the owner-operator to evaluate offers, respond to diligence, and execute the transaction confidentially while continuing to operate his business without disruption from news of the sale. For more information on how we can assist your company with its merger and acquisition needs, please email Michael Stone or call him at (205) 458-9137. PW&Co’s advisory services related to the asset sale were provided through its affiliate, Porter White Capital Advisors, Inc.